Our 25 years of experience in the fruit bar industry is reflected on the quality of our product. Real fruit taste, comes from real fruits; that is why at Helados La Tapatia we use only 100% high quality natural fruits and no preservatives. We stand behind our product, and guarantee that every bite, of any of our many fruit bars will be as delectable as the fruit itself. Once you taste an Helados La Tapatia fruit bar no other fruit bar will do. We care about our product, which is why you will never find an artificial flavor in our fruit bars. One taste and you will see that Helados La Tapatia is phenonomal. 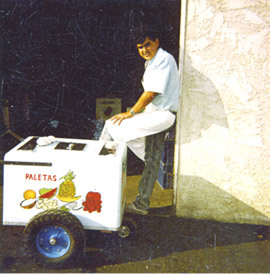 Helados La Tapatia is interested in establishing fruitful relationships with distributors and retailers for their freezer program. Capture the taste of authentic fruit bars in the ever expanding mainstream market. Please contact us for more information. "The Cookies 'n Cream is the best flavor. I tried others and nothing compares!" "Everytime I eat this product the taste is ALWAY consistant."